El Camino Real de los Tejas stretches 2,500 miles from colonial Mexico City through Texas and ends in Natchitoches, Louisiana. This trail provided the only primary overland route from Mexico across the Río Grande to the Red River Valley. Other trails such as the Lower Road, Old San Antonio Road, and Laredo Road were also created along this route to accommodate varying weather conditions, terrain, and relations with American Indians. The Spanish began using the trail in 1690, when Alonso de León, a Spanish explorer, crossed the Rio Grande heading to eastern Texas to establish missions. He followed routes previously used as Indian trails and trade routes. The following year, Domingo Terán de los Ríos traveled the same route with additional missionaries. Along with missions, the Spanish built presidios to protect Spanish territory from French intrusion, as well as trading posts and ranches. Throughout the 17th century, Spain, France, and England engaged in a major power struggle to control North America. This fight over control served as a catalyst for exploration, settlement, and trade. El Camino Real de los Tejas was used extensively during the period when Texas was Spanish, then Mexican, land. When Texas became independent, trade between Texas and Mexico declined while trade between Mexico and the United States increased. The trail was briefly a way to get supplies to the Confederacy and to send cotton to Mexico, but this soon waned with the arrival of the railroad. By the mid-19th century, El Camino Real de los Tejas was no longer in use. During its heyday, the trail had a permanent impact on the people of Texas and Louisiana. 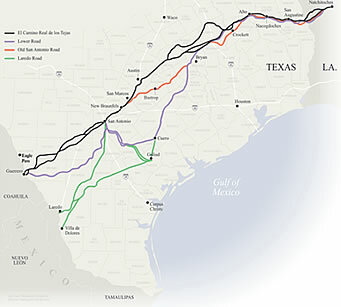 Growing interest in the history of El Camino Real de los Tejas caused the Texas Legislature to research the route in 1915. V. N. Zively, a professional surveyor, surveyed the trail and placed wooden markers along it. In 1918, the Texas Daughters of the American Revolution installed inscribed pink granite markers every five miles along the route to mark it. Today, visitors can see nine of these granite markers in their original locations. A number of towns along the route have their own monuments and historical markers to commemorate the trail, including Natchitoches, Louisiana and Cotulla, Texas. In 2004, El Camino Real de los Tejas became a National Historic Trail. The trail passes through Cane River Creole National Historical Park (a part of the Cane River National Heritage Area) in Natchitoches Parish, Louisiana. Using a land grant from the Spanish government, Jean Pierre Emmanuel Prudhomme established Oakland Plantation in 1789. Here, cotton was harvested and bailed by Prudhomme’s enslaved African American laborers. 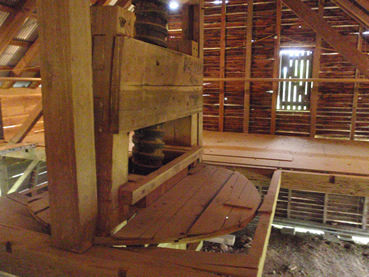 Visitors are able to explore many of the plantation’s original buildings and structures, including the main house, carriage house, slave/tenant quarters, and cotton gin ruins. Magnolia Plantation began cotton production in 1840. As this plantation grew, it became the largest cotton-producing plantation in Natchitoches Parish. In 1864, the Union army burned the main house at Magnolia Plantation but the brick slave houses still stand for visitors to see. Cane River National Heritage Area is the site of the Spanish Mission of San Miguel de los Adaes (commonly abbreviated as just Los Adaes.) The Spanish founded the mission in 1716 to convert local American Indians to Christianity and stop the French from expanding into Spanish Texas. In 1729, Los Adaes became the capital of Texas and served in this role until 1770. Los Adaes was abandoned in 1773. While no buildings of the mission or presidio of Los Adaes still stand, the area remains an important archeological site, and a visitor center there tells the story of Los Adaes. Los Adaes is featured in this itinerary here. In Sabine Parish, Louisiana, Fort Jesup is also in the Cane River National Heritage Area. It was constructed in 1822 to protect the border with Spain and the United States. Later, Texas passed to Mexican control, but became American territory after the United States won the Mexican War of 1846. After the war, Fort Jesup was considered unnecessary and later abandoned. Visitors can see the restored kitchen and reconstructed officers' quarters, which also serves as a museum. To learn more about Cane River National Heritage Area, please view the Cane River National Heritage Area Travel Itinerary. Along with Los Adaes, there were other Spanish missions along El Camino Real de los Tejas. Mission Nuestra Señora de los Dolores de los Ais in San Augustine County, Texas was built in 1716-1717 to convert the local Ais tribe to Christianity. A military inspection completed in 1767 revealed that the mission was not very successful, having only baptized 11 members of the Ais tribe in nearly 50 years, so the mission was closed in 1773. Nothing remains of the mission, but an interpretive complex at the site includes a museum and archeology lab. Visitors can also see a visible swale, or rut, in the ground of the mission site that indicates a section of El Camino Real de los Tejas passed through it. The best known cluster of missions along El Camino Real de los Tejas is part of the San Antonio Missions National Historical Park: Mission Nuestra Señora de la Purisima Concepción de Acuna, Mission San José y San Miguel de Aguayo, Mission San Juan Capistrano, and Mission San Francisco de la Espada. These four missions, established in the 18th century along the San Antonio River, became the foundation for the City of San Antonio. Each mission offers much to see. The San Antonio Missions National Historical Park is featured in this itinerary here. The Alamo, or Mission San Antonio de Valero, also in San Antonio, is another mission along El Camino Real de los Tejas. Established in 1718, the mission became the site of a famous battle during the Texas Revolution in 1836. 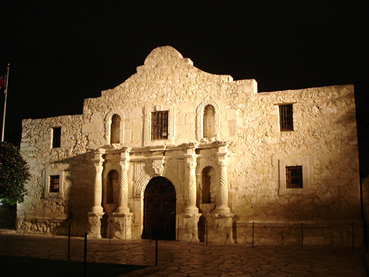 At the Alamo, Mexican President Santa Anna’s army defeated 190 members of the Texas Army, including William Travis, James Bowie, and David Crockett. This incident later inspired the battle of San Jacinto, which led to the independence of Texas. To learn more about the San Antonio Missions National Historical Park and the Alamo, please view the South and West Texas Travel Itinerary. El Camino Real de los Tejas paved the way for the development of present day Mexico, Texas, and Louisiana, and today brings alive the stories of the Spanish and the other peoples who left their legacies along the route. El Camino Real de los Tejas National Historic Trail, a unit of the National Park System, stretches across Texas and Louisiana. There is no formal auto tour route for the trail, but visitors and convention bureaus in communities located along the trail can provide information about local attractions and activities. For more information, visit the National Park Service El Camino Real de los Tejas National Historic Trail website or call 505-988-6098. • Mission San José; Historic American Buildings Survey. Many of the places to see along the trail are included in the National Park Service South and West Texas Travel Itinerary, the Cane River National Heritage Area Travel Itinerary, and the Places Reflecting America's Diverse Cultures: Explore their Stories in the National Park System Travel Itinerary. The San Antonio Missions National Historical Park is the subject of an online lesson plan, San Antonio Missions: Spanish Influence in Texas. The lesson plan has been produced by the National Park Service’s Teaching with Historic Places program, which offers a series of online classroom-ready lesson plans on registered historic places.